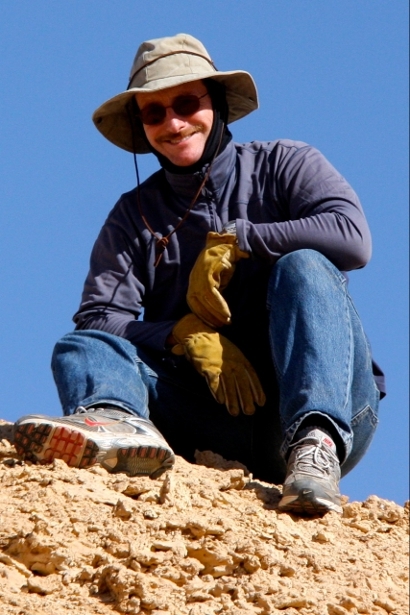 Left: Albert Haldemann, pictured in the Dakhleh Oasis in Egypt where, along with colleagues, he has found evidence for an extraterrestrial impact event. When Albert Haldemann joined the multicultural ExoMars team, he had already been exposed to many different cultures in the course of acquiring the valuable experience that he brings to the project. Albert was born in Bern, Switzerland, in 1966. Four years later, his family moved to Toronto, Canada, where he grew up and attended high school. In 1984, he returned to Switzerland for his college education at the Université de Neuchâtel, obtaining a Diplôme de Physicien in 1991. This was followed by a period in the Swiss Air Force as a militia pilot of Hawker Hunter ground-attack jets prior to enrolling at the California Institute of Technology (Caltech) to pursue a PhD (awarded in 1997) in Planetary Science. Part of his thesis involved the radar characterisation of candidate landing sites for NASA’s Mars Pathfinder (MPF) mission. As a result of his graduate work, Albert was invited to join the Mars Pathfinder Science Team one month before MPF landing, initially as a post-doc researcher and shortly afterwards as a staff member at the Planetary Radar Group at the Jet Propulsion Laboratory (JPL). During this period Albert's work included examining the geomorphology of the MPF landing site and relating his findings to his Mars radar studies. One of Albert’s other responsibilities in the Radar Group of JPL was as the Deep Space Network scheduling representative for the Goldstone Solar System Radar. Following Pathfinder, Albert continued to divide his time between Mars radar studies and mobile robotic payload operations. He is particularly proud of the fact that, with the Planetary Radar Group, he observed Mars with resolution equivalent to Hubble, using Earth-based delay-Doppler interferometric measurements. He also led the integration of the instruments onto JPL's Field Integrated Development and Operations rover, FIDO. Albert relinquished FIDO to become the Mars Exploration Rover (MER) Deputy Project Scientist in the Autumn of 2000 (FIDO wasn't forgotten: she was used for MER field testing and operations training). He combined his MER responsibilities with his Planetary Radar Group duties until 6 months prior to the first (of two) MER landings at which point MER required full time attention until 2006. Then, after a six-month stint maturing technology for a lunar scientific payload, Albert took on managerial responsibilities for some 90 planetary scientists as the Deputy Manager of JPL’s Planetary Science and Life Detection Section. After 15 years in Pasadena, Albert finally moved back to Europe in April 2007 when he accepted the ExoMars position at ESA's European Space Research and Technology Centre (ESTEC) in the Netherlands. Albert now manages a much smaller team than at JPL, but is responsible for all of the instruments on the ExoMars Trace Gas Orbiter (TGO), the Entry, Descent and Landing Demonstrator Module (EDM) and the Rover. Albert, what are your main responsibilities as the Payload and AIV Manager? First, AIV stands for Assembly, Integration, and Verification. This means that, with my team, I am responsible for overseeing the building and testing of the ExoMars spacecraft (the TGO, the EDM and Rover) by the industrial team and for guaranteeing that ESA’s specifications are followed. Specifically, these activities involve putting together the pieces of hardware that become the TGO, EDM, and the Rover, and also checking at each step that all the pieces are functioning properly. The goal of these activities is to verify that each spacecraft can complete all of the functions enabling it to accomplish its mission. Second, my team and I are responsible for ensuring that all the scientific instruments for the ExoMars programme are compatible with the spacecraft and can accomplish their scientific objectives. This responsibility covers the nine instruments of the scientific payload on the Rover, the five instruments on the TGO, and the instrument package on the EDM. The range of instruments - from orbiting spectrometers (ACS and NOMAD) to a Rover-mounted ground-penetrating-radar (WISDOM) - is broad, which makes the task both interesting and challenging. What have you enjoyed most about your career so far? Mars! I have been very lucky to have been able to focus so much of my scientific and technical efforts during the past 15 years on the exploration of a single planet, Mars, which fascinates me. There have been many highlights, and some low points, during that ongoing adventure, but it has all been exciting. 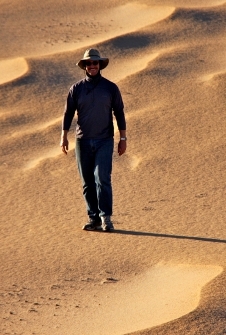 Right: Albert Haldemann, pictured walking on small sand dunes at Dakhleh Oasis in Egypt where he has worked to map the effects of an impact event that occurred during the Stone Age. The ExoMars programme is challenging because we are building, essentially, three different space vehicles – an orbiter, a lander and a Rover - to access three very different environments at Mars: the orbital environment - with TGO; the atmosphere – with EDM, and the surface with the Rover. For AIV, this means that we need to be aware of the different environmental requirements that are placed on each element. Therefore, we have to take into account that the tests on the Rover are very different from tests on the TGO, which are different again from some of the tests on the EDM. Why did you choose to work on the ExoMars programme? ExoMars offered me an opportunity to continue the Mars exploration activities I began in the U.S.A at Caltech and JPL with NASA, while moving back to Europe with my family to be closer to relatives here; ExoMars is in many ways 'having my cake and eating it too'. I greatly enjoy the working environment at ESTEC, where technical discussions take place in many languages. Perhaps because I grew up essentially as an ‘expat’ in Canada, I don’t find this strange, but rather I find it a very comfortable working environment. The ExoMars team is fully international, with industrial team members all over Europe, and instrument teams not only across Europe but also in Russia and the U.S.A. The fact that ExoMars is now part of a cooperation between ESA and Roscosmos, broadens the scope of our international team, and as the two space agency partners and our respective industrial teams work to align their work cultures with a common objective of Mars exploration, we all learn a lot from each other. ExoMars is unique in many aspects, but one aspect in particular drew me to the programme: ExoMars will deploy the first drill to the Martian surface to go deeper than 10 centimetres. We plan to acquire samples of Martian rocks that have been buried, for billions of years, by up to 2 metres of material. This 'protective cover' would have sheltered the samples from the potentially modifying effects of solar ultraviolet light and cosmic radiation, as well as from the winds, sands and dust of the Martian surface. Simply put, we don’t know what we will find. The hope is that a metre or two of soil cover is enough to protect ancient organic molecules that might tell us why there isn’t life on Mars, or if there was, what happened to it. Even if we find no organic molecules, but only succeed in sampling buried rocks, we will have achieved a major technological first in Mars exploration, and that is exciting! The scientific motivation behind ExoMars is to take the next steps in the astrobiological study of Mars. However, the big question I would like to see addressed in the context of Mars exploration is “what should the role of humans be in Mars exploration?”. We have not yet sufficiently explained why we want to explore Mars with manned missions rather than with robots. I think it is especially important to clearly articulate the reasons why we would want to make the enormous investments that the human exploration of Mars will require. What we learn from ExoMars will certainly add information to address the question. What is your vision or hope for the future of the programme? There are many elements of the ExoMars programme that I look forward to. I know that I will be just as excited when I see the TGO and EDM lift off from the Baikonur Cosmodrome in January 2016 as when I watch the lift off in 2018. And I know, from past experience, the thrill I will feel when our ExoMars EDM lands successfully on the surface of Mars in 2016, and again in 2019 when the ESA-Roscosmos Descent Module lands successfully too, followed by the ExoMars Rover rolling away from its landing site. I am committed to achieving these exciting moments - to share with my family, my team, my friends, and the public at large; ExoMars promises plenty of excitement to come. K.W. Larsen, R.F. Jurgens, A.F.C. Haldemann, M.A. Slade, and H.C. Rumsey, Terrestrial Quadstatic Interferometric Radar Observations of Mars, IEEE Trans. Geosci. Rem. Sens., 48, 6, pp.2670-2684, 2010. Haldemann, A.F.C., E.T. Baumgartner, G.H. Bearman, D.L. Blaney, D.I. Brown, B.P. Dolgin, L.I. Dorsky, T.L. Huntsberger, A. Ksendzov, J.C. Mahoney, M.J. McKelvey, B.E. Pavri, G.A. Post, E.F. Tubbs, R.E. Arvidson, N.O. Snider, S.W. Squyres, S. Gorevan, G. Klingelhofer, B. Bernhardt, and R. Gellert, FIDO science payload simulating the Athena Payload, J. Geophys. Res., 107 (E11), 8006, doi:10.1029/2001JE001738, 2002.